"Don't worry. On a new job it's quite common for things to not go well at first." Tom Selleck made his motion picture debut in 1970's Myra Breckinridge, though it would take a decade for him to come to major attention as Thomas Magnum, the laid back star of the hit TV series, Magnum P.I. While boosting his public profile enormously, his Magnum contract also cost him a role Steven Spielberg had slated for him, that of Indian Jones, one that would elevate Harrison Ford's popularity exponentially. Selleck's film breakthrough came in 1987's Three Men And A Baby, though his choices for followups didn't fare as well. 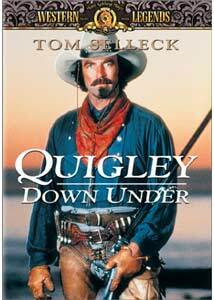 In 1990 he signed on for Quigley Down Under, a project he had been interested in for some time. Wanting to resurrect the western genre, director Simon Wincer ( Lonesome Dove, Crocodile Dundee In Los Angeles) took his crew to Australia's outback, where the endless vistas could form a perfect backdrop for the film. Matthew Quigley (Selleck) answers a want ad for the best long-range shooter in the world. Travelling three months from America to Australia with nothing but his saddle and long rifle, he manages to get in trouble before he has even left the ship. Coming to the rescue of a damsel in distress (Laura San Giacomo as Crazy Cora), his first course of duty is fighting off three locals, who just happen to be there to take him to his employer, Elliott Marston (Alan Rickman), owner of the expansive Marston Waters Ranch. After several days' journey across the outback they arrive at the ranch, where Marston outlines the duties he has in mind for the sharpshooter, after an impressive demonstration of Quigley's skills with his Creedmore Shiloh Sharps 45/110 Rifle. However, instead of killing dingos as Quigley had expected, his task is, instead, to rid the countryside of the native Aborigines, who until now had managed to keep out of rifle range. Quigley responds by throwing Marston out of his own house, but then the ranchhands beat him senseless, then take him and Cora into the outback, leaving them for dead. When a group of Aborigines rescue them from certain death, the conflict with Marston begins in earnest, as Quigley becomes a man with a price on his head, and all of Marston's men go on the hunt for him. As a modern western, this one is really well done. Action is plentiful, the characterizations extremely excellent, as are the costuming and cinematography. While the plot does have several holes in it, it is still an enjoyable and entertaining watch, and the vast Australian outback is captured in all its splendor and hostility. Dialogue is witty, and Selleck's personification of Quigley goes over well. Rickman excels, as usual, as the bad guy, and Laura San Giacomo does a good job making herself annoying, yet likeable as Quigley's somewhat half-wit sidekick, who he determines is half a bubble shy of plumb. Those looking for messages will find parallels between the Australian's treatment of their Aboriginal people and the North American settlers and Native Americans, though those seeking simple escapist entertainment need not be worried about excessive preaching on the subject. Production values are high, direction is tight, and the Australian setting gives a different twist on the standard western. I liked it. Image Transfer Review: As befitting a film with a setting this expansive, MGM has delivered an excellent 2.35:1 anamorphic transfer. Detail is very good, colors deep and rich and black levels solid. A few long shots suffered from a bit of blurriness, and there is a bit of gate wobble near the beginning, but all in all this is a great looking transfer. Audio Transfer Review: The stereo surround track is excellent, with decent soundstage width, and appropriate directiveness. No distortion or hiss is present and the mix works well. Dialogue is easy to discern. Nothing here detracts from the presentation. Extras Review: An on location piece running 7m:12s is the main extra. This is your typical sort of promo, though it does contain a few shots not used in the final cut. Save this until after you've seen the film for the first time. A full-frame theatrical trailer, which also contains some variations on scenes and dialogue, and two-30 second TV spots complete the set. A highly underrated western chock-full of action and adventure, with the charismatic Tom Selleck at the helm, playing against the evils of cattle baron Alan Rickman and his henchmen. The scenic outback makes for a perfect setting for gunfights and horse chases, and the comical dialogue elevates the film well above standard fare. Recommended.